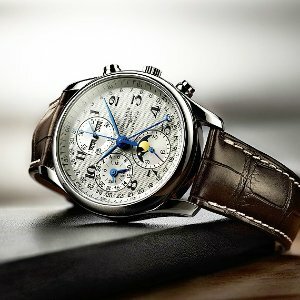 JomaShop.com offers the LONGINES Master Collection Men's Watch L2.673.4.78.3 for $2245.00 via coupon code DMOONFS50 . Features: Stainless steel case with a dark brown leather strap. Fixed stainless steel bezel. Silver textured dial with blue hands and Arabic numerals hour markers. Date scale around the outer rim. Minute markers around the inner bezel. Luminescent hands and markers. Day of the week and month dispyed at the 12 o'clock position. Chronograph - three sub-dials displaying: dual 24 hours / 60 seconds, 30 minutes and 12 hour / moon phase. Longines calibre L678 automatic movement with a 48-hour power reserve. Scratch resistant sapphire crystal. Skeleton case back. Case size: 40 mm. Case thickness: 14 mm. Water resistant at 30 meters / 100 feet.